The Messerschmitt Me-163 was a single-seat rocket powered interceptor that served from 1944 to 1945. It was the fastest and most radical airplane of the war. In 1937 Professor Alexander Lippisch headed the project called “Project X” that produced the DFS 194 rocket test aircraft which became the predecessor of Me-163. Lippisch was transferred to Messerschmitt in 1939 and the project was transformed into a combat aircraft. The first Me- 163A prototypes were tested in 1941, but powered flight testing of the more advanced Me 163B was delayed until August 1943 because of engine and fuel problems. In August 1943 the “Komet” was powered by the Walter HWK 109-509 rocket engine with a thrust of 16,65 kN.. The Me-163B was a small tailless aircraft that had to take off from a trolley and land on a sprung skid. Sitting in a pressurized cockpit in the nose, the pilot could fire two 30mm MK 208 cannon in the wing roots. Later in the war the Me-163B’s were equipped with 24 x R4/M rockets which could shoot down a B-17 Flying Fortress with a single hit. Production Me-163Bs were not ready for operational use until July 1944. The Luftwaffe planned to have small units of Komets dispersed to intercept Allied bomber formations, but only 279 Me 163Bs were delivered by the end of the war. The sole operational Komet group, JG 400, scored 9 kills while losing 14 of its own aircraft mostly on accidents. 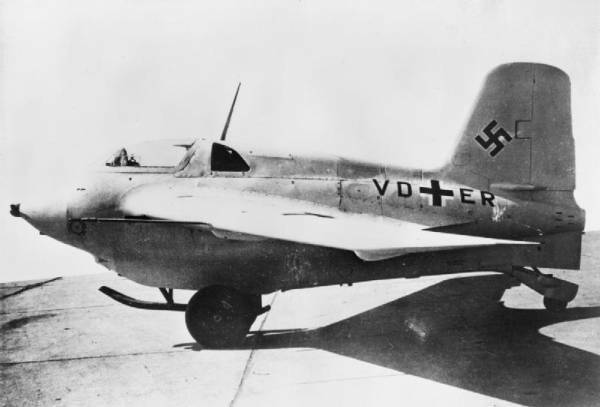 The Me 163 had an unprecedented performance. In just over 2.5 minutes the “Komet” could climb steeply to 9,000 meters and then either intercept the bombers or glide for long periods to wait for the bomber formations to come. It was extremely difficult to catch it. But heavy casualties resulted from explosions and collisions on landing, when the two extremely volatile and highly reactive rocket fuels were mixed together as the skid sustained the plane’s weight during landing.